Through Pocklington School I have been involved with the plays for 12 years, and have thoroughly enjoyed the remarkable opportunity it has given us to perform York’s own plays in front of thousands. 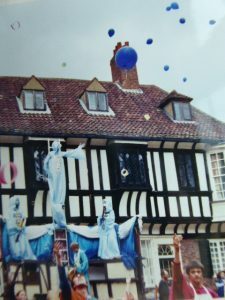 The School’s connection began in 2006 when we staged the entire cycle in our theatre, followed by an invitation to perform The Potters’ Pageant Pentecost, for the York Civic Society as part of the Guild Plays. This included a set modelled on a medieval street and a dance in which pots were lobbed between performers. The ending saw the greater understanding of God expressed through the release of helium balloons which soared into the clouds. 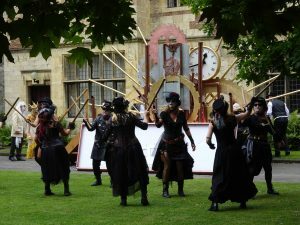 In 2010 we began the first of our productions for the Company of Merchant Adventurers with Doomsday. The Company ‘own’ the final play of the sequence, having been the original guild in charge of its delivery, so the invitation was especially exciting. 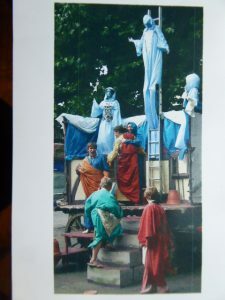 The house style of street theatre, interaction and carnival elements was introduced here and included extraordinary devils on running stilts and a God who stood in the centre of the sun. The costumes remained loosely medieval and the set was full of fabric. In 2014 the end of the world became synonymous with the steampunk movement which imagines that the world ended technologically around 1900. 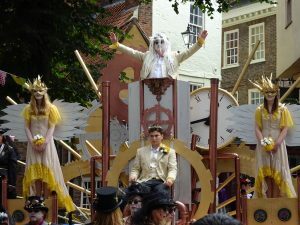 With a dreadlocked God and cog-driven angels the play was rebranded The Last Judgement and included fantastical Edwardian costumes. The dates for performance were beyond the School’s term so the theatrical East Riding Morris Dance side Ravens Morris were invited to join. For 2018 the dates have changed again. Because of this, while Pocklington School remains involved, it is Ravens Morris who are now in the driving seat for the Merchant Adventurers. This has released the spirit of carnival more than ever as they embrace the view that the closing play should function much as a jig at the end of an Elizabethan tragedy, or a comedy after a Greek tragic trilogy by celebrating the fact that we are here and alive now and therefore still able to change. 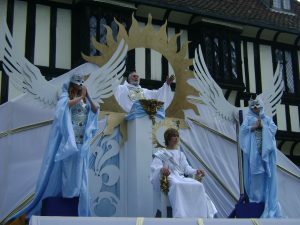 This time called Judgement Day, it includes giant puppets, rousing music, dance, song and illumination. Working for Ravens Morris makes this my fourth directing job with the plays and is set to be the most enjoyable yet as we welcome other community partners to join us in creating this final spectacle. Already the line up is taking impressive shape. Original music is being created by folk band The Bertie Set, with original choral pieces by the composer Stuart Nettleship. Master puppeteer from Kissing Gate Theatre Company, Terry Tooby, is on board. Members of the Stamford Bridge Singers, the Weighton Waits, Market Weighton Players and, of course, Pocklington School are performing. The role of Jesus will be played by professional actor Julian Finnigan and – no surprises here – Ravens Morris will be dancing! Favourite moments from the past? How about the skull on a stick being poked through the upstairs window of a Chinese restaurant to the delight and horror of the diners? Or the time when one angel fell ill after the first show (not a favourite bit for her) and our photographer had to strip off, take over her mask and costume and sing Latin harmony five minutes later. 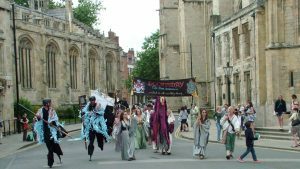 Or the sight of the stilt-running devils sprinting and bounding past the Minster. Or the wonderful reception from audiences. And without doubt the friendliness of the other groups and the superb organising committee. We have loved being a part of these plays and hope you will enjoy watching them. If you want to join in with Judgement Day get in touch: Ravensmorris@hotmail.co.uk ! Come and join the fun. By York Mystery, thanks a lot for the article post.Much thanks again. Fantastic.